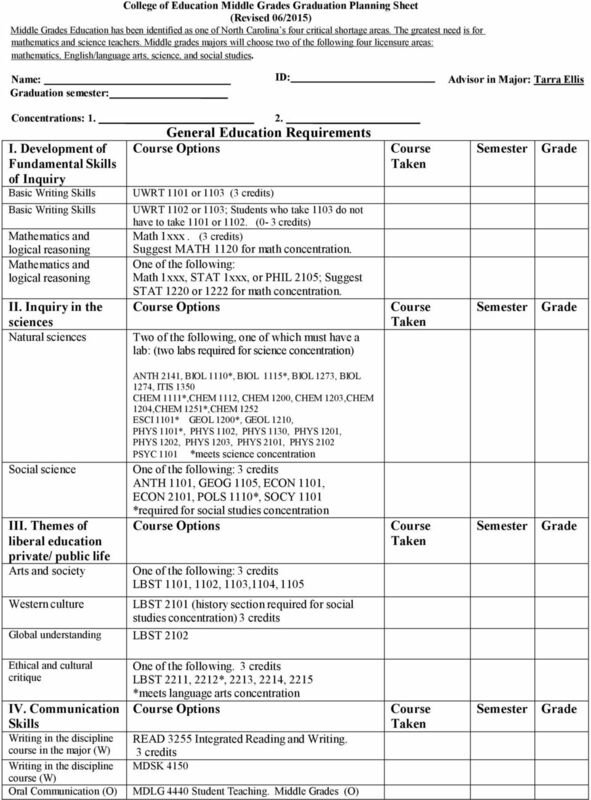 Download "Academic Plan of Study"
1 Department of Middle, Secondary, and K-12 Education Major in Middle s Education (BA Degree: hours General Education Hours vary based on Concentration) College of Education Program Summary Information: Academic Plan of Study Declaring the Major: Minimum of 2.5 GPA requirement; Passing scores on all three parts of Praxis Core or acceptable alternatives (SAT or ACT scores); s on EDUC 1100/2100 and SPED 2100 of C or better. 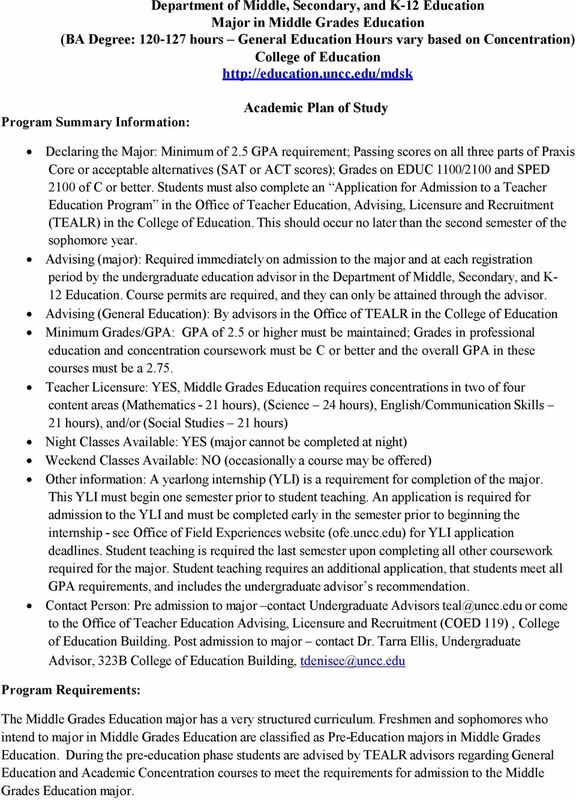 Students must also complete an Application for Admission to a Teacher Education Program in the Office of Teacher Education, Advising, Licensure and Recruitment (TEALR) in the College of Education. This should occur no later than the second semester of the sophomore year. Advising (major): Required immediately on admission to the major and at each registration period by the undergraduate education advisor in the Department of Middle, Secondary, and K- 12 Education. permits are required, and they can only be attained through the advisor. Advising (General Education): By advisors in the Office of TEALR in the College of Education Minimum s/gpa: GPA of 2.5 or higher must be maintained; s in professional education and concentration coursework must be C or better and the overall GPA in these courses must be a Teacher Licensure: YES, Middle s Education requires concentrations in two of four content areas (Mathematics - 21 hours), (Science 24 hours), English/Communication Skills 21 hours), and/or (Social Studies 21 hours) Night Classes Available: YES (major cannot be completed at night) Weekend Classes Available: NO (occasionally a course may be offered) Other information: A yearlong internship (YLI) is a requirement for completion of the major. This YLI must begin one semester prior to student teaching. An application is required for admission to the YLI and must be completed early in the semester prior to beginning the internship - see Office of Field Experiences website (ofe.uncc.edu) for YLI application deadlines. 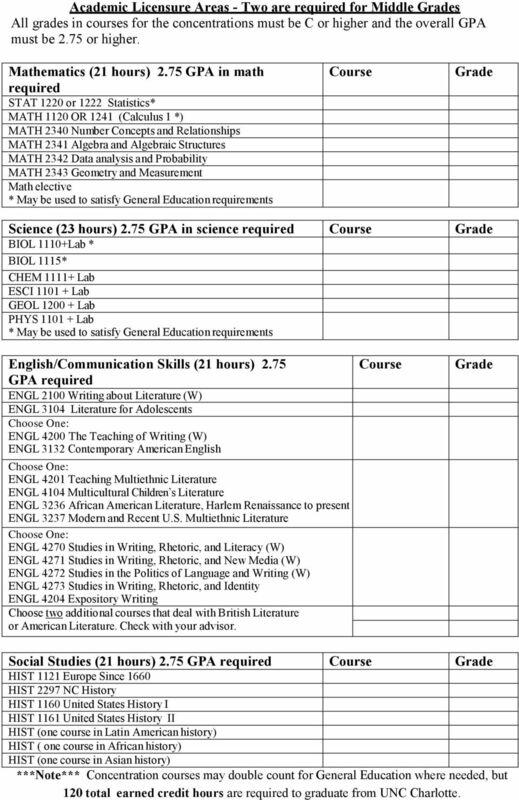 Student teaching is required the last semester upon completing all other coursework required for the major. Student teaching requires an additional application, that students meet all GPA requirements, and includes the undergraduate advisor s recommendation. Contact Person: Pre admission to major contact Undergraduate Advisors or come to the Office of Teacher Education Advising, Licensure and Recruitment (COED 119), College of Education Building. Post admission to major contact Dr. Tarra Ellis, Undergraduate Advisor, 323B College of Education Building, Program Requirements: The Middle s Education major has a very structured curriculum. Freshmen and sophomores who intend to major in Middle s Education are classified as Pre-Education majors in Middle s Education. During the pre-education phase students are advised by TEALR advisors regarding General Education and Academic Concentration courses to meet the requirements for admission to the Middle s Education major. 2 Upon completion of the education pre-requisite courses, students apply for admission to the MDSK program as majors. Upon admission to full-standing in the program, students are advised through the MDSK Advising Center where they plan the remainder of their program of studies with the undergraduate advisor in that office (typically the junior and senior years). 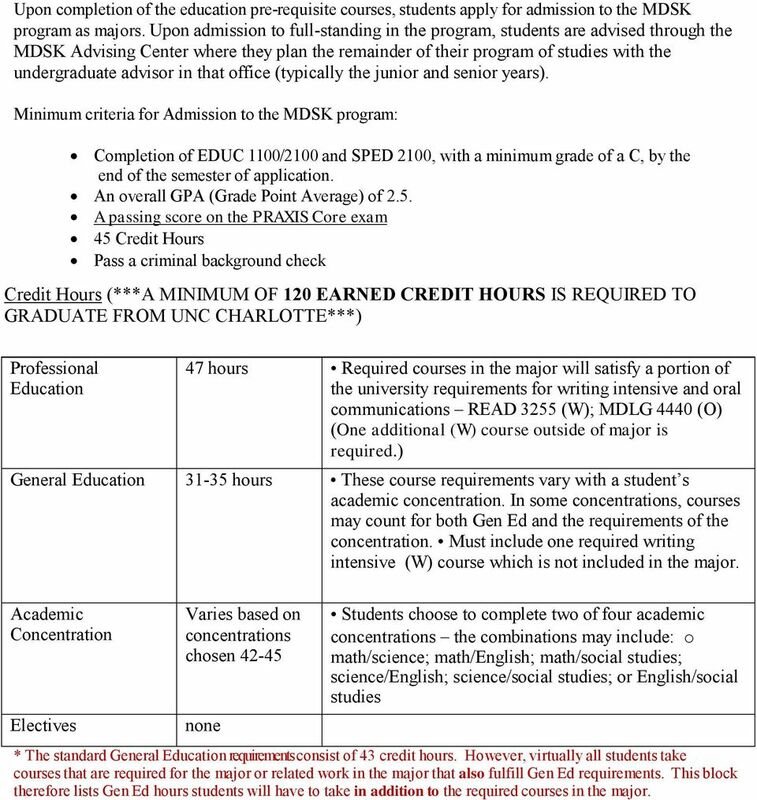 Minimum criteria for Admission to the MDSK program: Completion of EDUC 1100/2100 and SPED 2100, with a minimum grade of a C, by the end of the semester of application. An overall GPA ( Point Average) of 2.5. A passing score on the PRAXIS Core exam 45 Credit Hours Pass a criminal background check Credit Hours (***A MINIMUM OF 120 EARNED CREDIT HOURS IS REQUIRED TO GRADUATE FROM UNC CHARLOTTE***) Professional Education 47 hours Required courses in the major will satisfy a portion of the university requirements for writing intensive and oral communications READ 3255 (W); MDLG 4440 (O) (One additional (W) course outside of major is required.) General Education hours These course requirements vary with a student s academic concentration. In some concentrations, courses may count for both Gen Ed and the requirements of the concentration. Must include one required writing intensive (W) course which is not included in the major. Academic Concentration Electives Varies based on concentrations chosen none Students choose to complete two of four academic concentrations the combinations may include: o math/science; math/english; math/social studies; science/english; science/social studies; or English/social studies * The standard General Education requirements consist of 43 credit hours. However, virtually all students take courses that are required for the major or related work in the major that also fulfill Gen Ed requirements. This block therefore lists Gen Ed hours students will have to take in addition to the required courses in the major. 5 Academic Licensure Areas - Two are required for Middle s All grades in courses for the concentrations must be C or higher and the overall GPA must be 2.75 or higher. Mathematics (21 hours) 2.75 GPA in math required STAT 1220 or 1222 Statistics* MATH 1120 OR 1241 (Calculus 1 *) MATH 2340 Number Concepts and Relationships MATH 2341 Algebra and Algebraic Structures MATH 2342 Data analysis and Probability MATH 2343 Geometry and Measurement Math elective * May be used to satisfy General Education requirements Science (23 hours) 2.75 GPA in science required BIOL 1110+Lab * BIOL 1115* CHEM Lab ESCI Lab GEOL Lab PHYS Lab * May be used to satisfy General Education requirements English/Communication Skills (21 hours) 2.75 GPA required ENGL 2100 Writing about Literature (W) ENGL 3104 Literature for Adolescents ENGL 4200 The Teaching of Writing (W) ENGL 3132 Contemporary American English ENGL 4201 Teaching Multiethnic Literature ENGL 4104 Multicultural Children s Literature ENGL 3236 African American Literature, Harlem Renaissance to present ENGL 3237 Modern and Recent U.S. Multiethnic Literature ENGL 4270 Studies in Writing, Rhetoric, and Literacy (W) ENGL 4271 Studies in Writing, Rhetoric, and New Media (W) ENGL 4272 Studies in the Politics of Language and Writing (W) ENGL 4273 Studies in Writing, Rhetoric, and Identity ENGL 4204 Expository Writing Choose two additional courses that deal with British Literature or American Literature. Check with your advisor. Social Studies (21 hours) 2.75 GPA required HIST 1121 Europe Since 1660 HIST 2297 NC History HIST 1160 United States History I HIST 1161 United States History II HIST (one course in Latin American history) HIST ( one course in African history) HIST (one course in Asian history) ***Note*** Concentration courses may double count for General Education where needed, but 120 total earned credit hours are required to graduate from UNC Charlotte. Students: please fill in the blanks below, read the agreement and sign. and Articulation Agreement Regarding Degree Programs for Urban Teacher Preparation This agreement has been entered into by and for the benefit of students and prospective students at the two institutions. CRIMINOLOGY STATE UNIVERSITY OF WEST GEORGIA. UNDERGRADUATE MAJOR, MINOR, DEGREE DECLARATION (You must submit an approved form for each major. Dual Degree in HDFS & Elementary Education Frequently Asked Questions BASIC INFORMATION General Information How does this Dual Degree Work? Required Courses What classes are required to get these degrees? Program Title: Elementary Education B.A.